Technological advancements, access to consumer financing, and other market development factors are enabling an increasing movement of underserved households up the energy ladder. Fueled by the burgeoning market for small, efficient, and increasingly affordable appliances like fans, TVs – and sometimes even fridges – powered by small solar home systems and included in basic product offerings, the off-grid industry has made large strides in delivering energy services to those living off- and under the grid. Since 2016, the Global LEAP Awards results based financing program has played a key role in supporting development of the off-grid appliances market. By pairing a competition to assess the relative quality of nascent off-grid technologies with results-based financing, the program has supported the delivery of new or enhanced energy access to over half a million individual beneficiaries to date across East Africa and Bangladesh. Beneficiaries have purchased energy-efficient off-grid TVs, fans, and refrigerators from off-grid distributors participating in the program. So what is currently understood about the impact of such off-grid appliances on end consumers? Speculative to little. For instance, while TVs are perceived to be a tool for entertainment, preliminary analysis of impact data collected through the Global LEAP Awards shows that TVs are being used, with equal importance, as a key source of information, especially on regional politics. Consumers may also experience benefits related to health and safety. Similarly, an entrepreneur living in eastern Uganda invested in a SolarNow 112-liter refrigerator that has allowed her to provide her community with cool, clean drinking water. Before, the nearest refrigerators were located six kilometers away on the main village road. “At the road, the water was not boiled,” she explains. “We had been falling sick of typhoid fever. I am now able to provide water that is clean. Ever since we started boiling the water, we can confidently trust that it’s safe.” Selling the water has enabled her to generate an additional income of 70,000 shillings ($19) per week, offsetting the costs from the fridge. 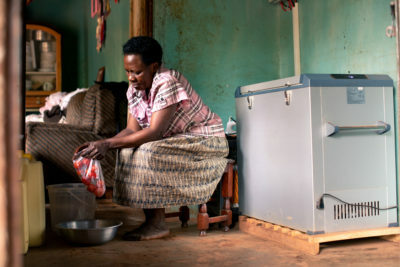 A women in eastern Uganda with her SolarNow off-grid refrigerator. Commercial markets for off-grid appliances remain nascent and face many barriers. Manufacturers, distributors who invest in understanding consumers – what they want, how they interact with the product, as well as the developmental and economic impacts of ownership – will be better placed to innovate, develop, and market products that can best service cash- and energy-constrained consumers. Research indicates that consumers living off-grid have relatively limited familiarity with appliances, thereby overlooking details that may seem intuitive to product designers. For example, during the Global LEAP Awards refrigerator field testing conducted in Uganda in 2018, some participating entrepreneurs reported dissatisfaction with the time it took to cool drinks intended for sale. Upon observation, the entrepreneurs continually replaced cold drinks with warm ones as they sold the cold ones. This constant cycling of different temperature drinks, combined with frequent door opens, greatly affects refrigerator power consumption and increases time needed to cool drinks. User education at the time of sale could better manage expectations about cooling time. In addition, manufacturers could use this information to iterate on the design of refrigerators aimed for use in small shops. The Global LEAP Awards, Efficiency for Access Coalition, and several partners operating in the sector continue to advance our much needed understanding of the impact of off-grid appliances on consumers. Here is just one of the videos emerging from our efforts. In the coming months, we will continue to share these videos, notable findings from our research, and other stories about consumers and their interaction with off-grid solar technologies. We hope that you will find them as insightful about consumers’ experiences as we do. The Global LEAP Awards is an international competition to identify and promote the world’s best off-grid appliances, accelerating market development and innovation. This unique program has evolved into a trusted global brand that serves as the de facto source of accurate, actionable information about the quality and energy performance of off-grid appliances, with support from Power Africa, UK aid, Energising Development, and in partnership with the Efficiency for Access Coalition. The Global LEAP Awards innovation deployment program featured in the video above was initiated in collaboration with Ideas to Impact, IMC Worldwide, and Energy 4 Impact, with support from Power Africa, UK aid, and Energising Development.